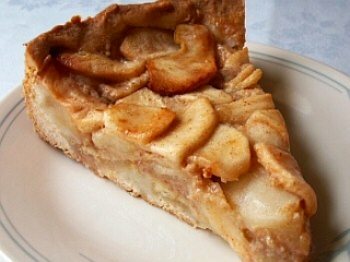 A cross between a cake and a pie...this flavorful, moist cake combines a fragrant cinnamon and vanilla-scented crust with a sugary cinnamon-vanilla custard and apple filling. The cake is easier to make than it sounds from the recipe -- it's actually fairly quick once you have your apples all peeled and sliced. Also, you can make it ahead of time and refrigerate until needed. This is a very good apple dessert, the sort of homey recipe that makes French home cooking so incomparable. In a large bowl, combine the flour, sugar, baking powder, salt and cinnamon, stir to blend. In a separate bowl mix the egg, butter and vanilla extract. Add the liquids to the dry ingredients and stir until well blended, making a soft but stiff dough. Add more flour, as needed, to ensure that you have a dough and not a batter. Cover with plastic wrap and chill for 30 minutes.Preheat oven to 350 degrees F.
In a large bowl, toss the apples with lemon juice and 1/4 cup sugar. Grease the bottom and sides of a 10-inch springform pan. Pat dough evenly on the bottom and sides of the pan (dough should be about 1/8- to 1/4-inches thick). Fill with apple mixture, pressing gently. Place in preheated oven and bake for 15 minutes; remove foil and bake until apples are soft, about 40 to 45 minutes. The apples on top will look a little dry; use a toothpick to test apples for doneness.While cake is baking, prepare custard by mixing the butter, sugar, eggs, vanilla and cinnamon together in a small bowl. Remove the cake from the oven at the 40-minute mark, check for doneness, and pour the custard mixture over top of the cake, allowing custard to fill gaps between the apples. Return to the oven and bake until the top is golden brown and the cake feels firm or set, another 20 to 25 minutes.Leave to cool on a rack for 15 minutes. Run a knife along the sides of the pan and, leaving the cake on the pan base, remove the rest of the springform tin. Let cake cool to room temperature, cover with plastic wrap and chill for 4 to 6 hours, or overnight. Dust with powdered sugar before serving, if desired.Makes one 10-inch cake, for 8 to 12 servings. * Note: Use enough sliced apples to fill your pan..